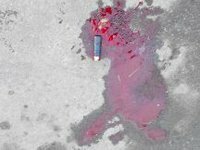 Ihor Kostenko, a journalist from the newspaper Sportanalytic (http://sportanalytic.com/), was killed on Independence Square in Kyiv on Thursday, the newspaper said on its website. "The Sportanalytic journalist died a hero's death for freedom and justice. One of the bodies outside Zhovtnevy Palace in Kyiv has been identified. It was a 22-year-old geography student, Ihor Kostenko, from Ternopil region," the statement said. The newspaper's editorial office has offered condolences to Kostenko's family and friends.